It’s Good Friday-Easter weekend already. That’s wild. This year is flying by. I hope that everyone who celebrates a holiday of some kind, whether it’s a religious one or not, gets to enjoy some good food as apart of it. It’s kind of become a tradition for me to cook a nice Brunch-Brinner for our house. I’ve actually been holding this post back for a while. I baked it right at the end of the summer, just before strawberries were finna go out of season. I made a judgment call to keep it in the Drafts folder all throughout the autumn and the long winter because I felt like it would be counterproductive and awkward to share a recipe with produce that would probably be out of season. Now that April is winding down and the weather is starting to warm up, hopefully strawberries are starting to become more readily (and affordably) available wherever you are. If so, then I highly, HIGHLY recommend that you get into this recipe. It has two components and strawberries are all up in both. You can incorporate just about any mix in that you want into a biscuit dough, including strawberries. However, they are very wet, especially when sliced. This can make assembling the dough somewhat messier than it may be normally, so in order to nix that issue, I froze the sliced strawberries ahead of time so that when they’re mixed into the biscuit dough, the juices wouldn’t gush out and make the dummy gummy. Don’t worry; when the biscuits bake the berries will thaw out perfectly. Now, listen. About the strawberry sauce. Let me talk to you about this strawberry SAUCE. It’s tart. It’s slightly sweet. It’s smooth. It’s sublime, and I want it for everything. My biscuits. My pound cake. My ice cream. My toast. All of the things. This dish is a taste of pure spring, and I think that all of you deserve to take a bite for this Easter weekend. So get to it. Spread the strawberries out in a single layer on a baking sheet that you line with parchment paper or aluminum foil. Place the sheet pan in the freezer for 60 minutes, until they are very firm. In a large bowl, combine the flour, baking powder, baking soda, and salt with a fork. Use the large holes on a box grater to grate butter directly into the frozen ingredients and stir to combine. Add the strawberries and stir together until strawberries are coated in the flour. Make a well in the center of the bowl and pour in the heavy cream, stirring together with a fork until just moistened. If it seems a little dry you can add more heavy cream until it comes together. Sprinkle a pastry mat, wooden cutting board or wax paper with flour. Turn the dough out onto the surface and pat a few times with your hands until it loosely holds together. (Don’t knead it too much or the warmth in your palms will melt the butter and cause the biscuits to be tough.) Pat and roll the dough into a rectangle. Take the two opposite ends and fold them together like a business letter into thirds. Flip it upside down and pat & roll it into another rectangle, sprinkling the surface with flour if it gets too sticky. Repeat the folding process two to three more times before patting it into one final rectangle, about 7-8 inches and 1 inch thick. Wrap in plastic wrap and refrigerate for at least 2 hours. Preheat oven to 425°. Place a shallow pan of water on the bottom rack of the oven. Place dough on a parchment-lined baking sheet. Use a bench scraper or very sharp knife to trim the edges of the rectangle. Using a floured pizza cutter or knife, cut 12 to 16 squares in dough, leaving biscuits intact. Place the sheet pan in the freezer for 20 minutes. Bake in the upper half of the oven for 17-20 minutes. Serve warm with the Strawberry Sauce. For Strawberry Sauce: In a medium saucepan combine the strawberries, sugar, and water. Bring to simmering; cook and stir until strawberries pop and sauce has thickened. Remove from heat, then stir in the vanilla. Serve warm or at room temperature. Sharing at Fiesta Friday #272, cohosted this week by Antonia @ Zoale.com and Angie @ Fiesta Friday. Tell me some of the traditions you or your family had when you grew up. How about some of the traditions that you have now? I think that my love for Christmas started because of all the traditions that we had while I was growing up. I enjoyed those traditions and the way that they made me feel, and it created this huge nostalgia for the holidays that lasts to this day. In elementary school, I remember the traditions that happened on the last day before our Winter Break. Classes ended early and for the latter half of the day, the school would turn into a ‘holiday carnival’ of sorts. Each classroom would turn into a fun activity for us to do until was time to go home. One room had games, one room had holiday movies playing on a television, one room was for making Christmas ornaments, another was for decorating Christmas cookies, and so on. My mom and my sisters and I had a tradition of driving around the neighborhood on Christmas Eve night and looking at other house’s lights and decorations that they put up. Now that I’m grown I have several holiday traditions of my own. We try to put up our Christmas tree within the first couple of weeks of November, which is also when I dust off my holiday playlist. There is a list of holiday movies that we watch all throughout the month of December. And of course, I do the 12 Days of Christmas here on the blog. I’ve heard about a lot of families that have a tradition of eating cinnamon rolls on Christmas morning. We don’t, but it’s a holiday tradition that I can definitely get behind. My sister doesn’t like cinnamon rolls (insert eyeroll emoji), so whenever I get the craving for breakfast rolls, I have to get a bit creative and make something that she’ll like. These Honey Sausage Rolls were a hit. These Orange Rolls were a HUGE hit. And then came today’s rolls. I don’t know who it was who first came up with the flavor combination of cranberry and citrus, but whoever they are, they were a genius who truly gave us a Christmas miracle. It has truly never, EVER let me down. These were so delicious. Where do I even begin? The dough itself is flavored with vanilla, orange zest and juice. The powdered milk and instant potato flakes are there to improve the overall texture of the finished product–it gives the rolls a chewy, but light richness. The filling is both tart and slightly sweet thanks to the combination of cranberry and orange juice. I think it gives a great, fresh balance of flavor to the icing that gets slathered on top of the rolls while they’re still warm. As you can see, this recipe makes a modest sized bunch. If you’re baking for a crowd, you may want to consider doubling it. You may want to consider doubling it even if you’re not baking for a crowd. I wish that I had. *A heaping 3/4 cup of leftover cranberry sauce will work in lieu of the filling as well. This is my go-to favorite recipe. Lightly spray an 8 or 9 inch square baking dish or cake pan with non-stick cooking spray; set aside. In a small bowl, pour the water, sprinkle the yeast on top. Sprinkle the sugar on top of that. Allow to sit for ten minutes, until proofed and frothy. In a medium size bowl combine the flour with the dry milk and potato flour and stir with a fork. Set aside. Grease the inside of the mixing bowl, place the dough inside. Cover with plastic wrap, then a damp kitchen towel and allow to rise until doubled in a warm place, about 65 minutes. To make the filling: Combine all of the filling ingredients except the melted butter in a small, heavy saucepan. Bring to a boil over medium-high heat, then reduce the heat to low and simmer for about 15 minutes, stirring occasionally, until thickened. Remove from the heat, and stir in the melted butter. Set aside to cool. Turn the dough out onto a clean work surface that you’ve sprinkled with flour and gently deflate. Roll/pat it into a 16 x 12 rectangle. Spread the filling out onto the dough. Roll up into a log tightly, pinching the seams closed to seal. Cut the log into 9 slices. and place the slices into your prepared baking dish. Cover with plastic wrap and your damp kitchen cloth. Allow to proof for an additional 45 minutes until doubled in size. Preheat oven to 375 degrees F. Brush the proofed rolls with the beaten egg. Bake until golden brown in the center (an instant read thermometer should read 195-200F), 35-40 minutes. Cover with foil if they’re browning too quickly. To make the icing, combine the powdered sugar with just enough OJ to make a smooth glaze. After the rolls have cooled for about 7-8 minutes, Spread the icing over the rolls while they are still warm so that the icing can seep into the crevices of the rolls. Keep any leftovers in a sealed plastic container in the fridge. I’ll be sharing these at this week’s Fiesta Friday #254, co-hosted this week by Antonia @ Zoale.com and Kat @ Kat’s 9 Lives. I seriously cannot believe that we are making our way through November already. 2018 is almost over. We’ve already started getting ingredients for Thanksgiving, which I’m always excited for, but it definitely doesn’t feel like it’s going to be happening in a matter of weeks. From there, things REALLY get busy round here, what with the 12 Days of Christmas baking series–I started making my list of this year’s recipes earlier today and I’m already excited to get started on that, so stay tuned. We still have brinner at least once a week in our house, but it’s been a while since I posted a new recipe for breakfast on the blog. 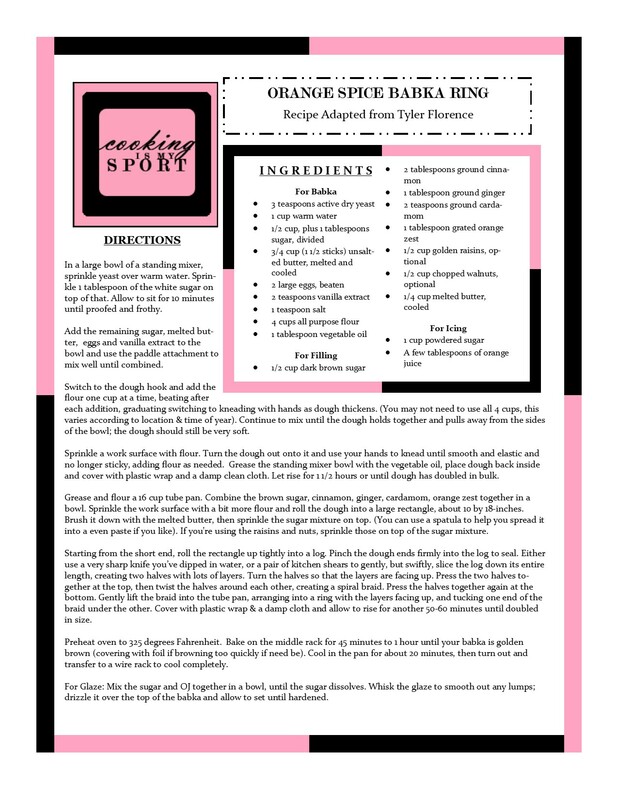 I wanted to change that and so this past week, I decided to go ahead and make something new for our brinner. Slab pie is one of those things that I really enjoy baking–more so than a lot of other things that I like. It makes a whole lot of pie for a crowd, with a comparatively low amount of labor. Up until now, I’ve only made sweet fruit dessert slab pies and although they’ve been fabulous I have been curious about what it would look like if I took it to the savory side. The method for making the pie crust is my normal method of grating frozen butter into the dry ingredients. It might seem ‘extra’ to go to the effort of buying a box grater if you don’t already have one, but I will say it again and again until I’m blue in the face: frozen butter & a box grater will change your pie crust making life. It will also transform the way you make biscuits and scones. If you don’t know, now you know. I think one of the best things about this recipe is how versatile the filling can be. I’ve provided a recipe below of what I used for our slab pie, but with breakfast foods in general, the possibilities are endless. It’s no different here. If you don’t like sausage as a protein, use ham. Or mushrooms. Or chorizo. If you don’t like green bell peppers, use red or yellow. If you don’t like spinach, use potatoes. Do what you heart (or tastebuds) tell you to do. Be careful when you pour the beaten eggs on top; make sure it’s mixed into the filling well so that it doesn’t spill over too much into the crust. Use your fingers to try and make sure the crust is pinched together tight at the corners of the pie especially. Also, bake the slab pie on the lower rack of the oven to make sure you get the golden brown, flakey crust results that you see in the pictures–the closer it is to the heat, the faster it will cook on the bottom. Have a good weekend, guys! For Crust: In a medium sized bowl, combine the flour with the salt and pepper. Use the large holes on a box grater to grate the cold butter directly into the dry ingredients. Stir together with a fork. Make a well in the center, then pour in the water. Stir together with a fork and spatula until it forms a craggy mass. Turn it out onto a floured surface and knead it two to three times, just until it comes together. Wrap in plastic wrap and refrigerate overnight. Preheat the oven to 375 degrees Fahrenheit. Grease a 17 x 11 baking sheet and set aside. Place the crumbled, browned sausage in a large bowl. In a large skillet, saute the onions, then the bell peppers until they are softened and translucent, about 7-10 minutes each. When finished, add to the bowl of sausage. Mix in the drained spinach. Stir together until evenly combined. Divide the pie crust in two, making one portion slightly bigger than the other. On a floured surface, roll out the larger portion into a 17 x 11 rectangle. Use your rolling pin to help transfer it to the greased baking sheet, using your knuckles to press the crust into the corners; try to make sure there’s some overhang over the sides of the pan. Spoon the sausage filling into the crust, smoothing over the top with a spatula. (You may have some leftover; place it in an egg scramble at a later use) Place in the refrigerator. Meanwhile, beat 12 the eggs together, then season generously with salt and pepper. Remove the filled pie from the refrigerator. Carefully pour the beaten egg mixture over the filling, using a fork to help it seep in evenly. Roll out the second piece of pie crust into a rectangle. Drape it over the filling, and crimp the edges to seal the pie. Use a sharp knife to create 2 steam vents in the center (not too big though, or the eggs may leak out). Beat the remaining egg in a small bowl with some water, then use a pastry brush to brush it over the top crust. Bake the pie on the lower rack of the oven until the crust is golden and the filling is set, 55-60 minutes. Remove from the oven and allow to cool about 10 minutes before slicing into squares serve. Sharing at the Fiesta Friday #249, co-hosted this week by Diann @ Of Goats and Greens and Jenny @ Apply To Face Blog. Hi, y’all. Sorry that it’s been a bit quiet around here for a while. I had company visiting and didn’t get around to getting up last week’s post. But things should be getting back to normal and on schedule now. I’ve got some recipes coming that I’m really excited to share in the coming week’s and today’s is one of them, so let’s just jump right into it. Yet another biscuit post. You excited yet? You should be. Biscuits alone are exciting to me, but these especially since they feature one of my favorite ingredients to both bake and cook with: cornmeal. I’ve said before that I have a mild obsession with cornmeal and the proof is in the amount of baked goods I’ve shared already on the blog. Take your pick, really. Cornbread. Yeast bread. Scones. Crackers. Some of it’s savory, some of it sweet. It’s a versatile ingredient and if you’re not familiar with it, allow me to strongly recommend you try to incorporate it into your baking routine. I think there are very few things that can’t be improved with a bit of cornmeal added to them. I’ve shared a recipe for cornmeal biscuits on the blog before, but that one was also flavored with ginger and Chinese Five Spice to pair with some fried chicken that I also flavored with five spice. This time around, I decided to go with more ordinary, traditional flavors that would produce a biscuit that could go with any kind of meal. So what’s the role that cornmeal plays in a biscuit? I’ve found that cornmeal (yellow cornmeal, that is) does two things to a biscuit: first it’s going to provide a contrast of texture that wouldn’t necessarily be in a biscuit made with just white flour. Don’t worry: it’s not at all going to be tough, but yellow cornmeal will make it slightly more grainy and chewy. Sounds weird, but I promise it’s marvelous. Second, yellow cornmeal has a natural savory flavor of its own. In the case of these biscuits, the cornmeal helps to further bring out the flavors of the salt and pepper in the dough. Although these biscuits do lean on the savory side, I paired them with a smooth, honey butter spread that comes together in seconds. The butter brings a great balance between the savory & sweet of these biscuits as a dish and honestly, I could eat them all on their own without even needing to add them to a meal. If you try them yourself some time, you’ll understand why. Have a good week, everyone. Sharing at this week’s Fiesta Friday #241, co-hosted this week by Zeba @ Food For The Soul and Debanita @ Canvassed Recipes. Preheat oven to 450 degrees Fahrenheit. Place a shallow pan of water on the bottom rack of the oven. In a large bowl, combine the flour, cornmeal, baking powder, baking soda, salt, and pepper. Using the large holes on a box grater, grate the butter into the dry ingredients and stir a few times to combine. Make a well in the center of the bowl. Pat and roll the dough into a rectangle. Take the two opposite ends and fold them together like a business letter into thirds. Flip it upside down and pat & roll it into another rectangle, sprinkling the surface with flour if it gets too sticky. Repeat the folding process two to three more times before patting it into one final rectangle. Use a bench scraper or very sharp knife to trim the edges of the rectangle. Use a 2 1/2-inch round cutter to cut biscuits, pressing and rolling the scraps together to make more biscuits two additional times. Discard the rest of the dough. Place biscuits, slightly touching, on a baking sheet lined with parchment paper. Chill 15 minutes in the freezer. Bake until golden brown, 15 to 20 minutes. (You may have to cover the biscuits with foil if they begin to brown too quickly. 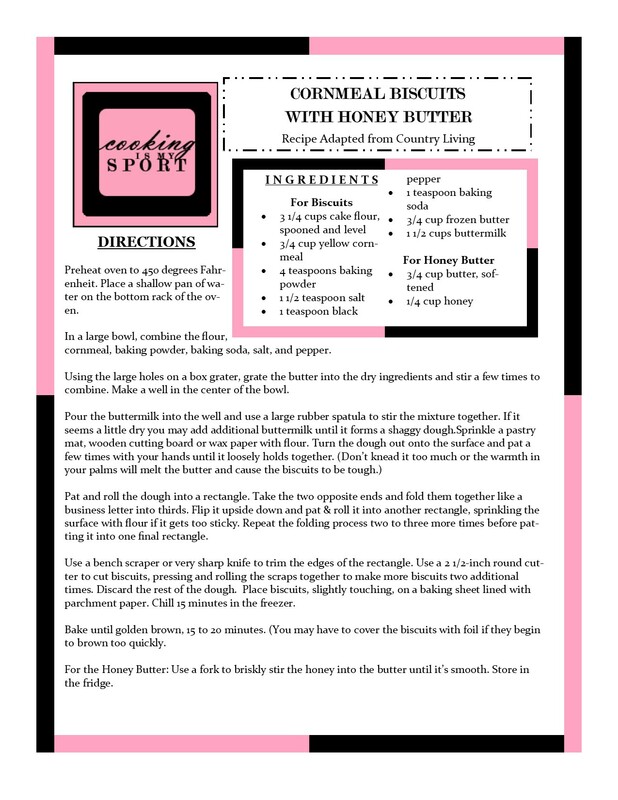 For the Honey Butter: Use a fork to briskly stir the honey into the butter until it’s smooth. Store in the fridge. One of the earliest food memories that I have is a love for glazed doughnuts. My mom’s taught Sunday School for practically my entire life and every Sunday morning on the drive to church I remember sitting in the back seat, still groggy, but also silently praying in my mind that she would stop by a cornerstore down the street from the church that sold the most delicious doughnuts for dirt cheap. My favorite one to get would be a plain glazed doughnut ring. No sprinkles. No frills. No bells & whistles. A plain, glazed yeast doughnut was really all I would want. The Sundays when I got one were instantly brighter Sundays. Perfectly glazed doughnuts were delicious enough to do that all on their own–they still are. I know there’s nothing quite like a glazed Krispy Kreme, especially when it comes hot off the belt. (Seriously, I’m drooling just thinking about it now), but I will also say that making glazed doughnuts at home can deliver the goods as well. Last week, I gave my own personal definitions/differences between donuts and doughnuts: donuts are those made without using yeast as a leavening agent, much like these cake donuts. Doughnuts do use yeast as a leavening agent. In any case, that’s how I choose to define them. I thought that a perfect glazed doughnut would be the perfect example to use for today’s post. So aside from the inclusion of yeast, what makes yeast doughnuts different from cake donuts? The biggest difference is texture. Cake donuts are given that name for a reason: the texture is going to be soft, but dense. I think of it almost being like a coffee cake that gets deep fried, then dunked in cinnamon sugar. Yeast doughnuts are much more lighter and airier on the inside. See what I mean? With yeast, there’s going to be a bit more time needed to set aside for the dough because unlike cake donuts, the yeast will need two rising times. The first is for the whole mass of dough, the second is for after you’ve shaped them into rings–OR, if you wanted to get creative with it, you can form them into cruller twists like you see in the pictures. This dough is admittedly, lightly sweetened. It’s main flavors are vanilla and nutmeg–they’re simple flavors that leave plenty of room for the real star of the show: that glaze. After you dunk the still warm doughnuts in the glaze, you then allow them to sit for a few minutes so that they can drip off the excess and allow the residual glaze to set. Don’t they look just divine? I promise you that they tasted even better than they look, which is why I encourage all of you to give them a shot yourself. You won’t be disappointed. Sharing at this week’s Fiesta Friday #236, co-hosted this week by Julianna @ Foodie on Board and Debanita @ Canvassed Recipes. In a small bowl pour the warm milk. Sprinkle the yeast on top. Sprinkle the 1 tablespoon of white sugar on top of that. Allow to sit for 10 minutes, until proofed and frothy. In a small bowl combine the beaten egg, melted butter and vanilla extract. Set aside. In the bowl of a standing mixer fitted with paddle attachment combine the flour, 1/4 cup of sugar, salt and ground nutmeg until just blended. Switch to the dough hook. Pour in the yeast mixture as well as the egg mixture to the dry ingredients and stir until a soft dough is formed. Cover and let rest for 5 minutes. Knead the dough for 6-8 minutes until it’s smooth and soft. Place the dough in a greased bowl, turn it over once, then cover with a piece of plastic wrap and a damp kitchen towel. Allow to rise in a warm place for 1 1/2-2 hours, until doubled in size. Turn the dough out onto a well floured surface and gently deflate. Roll out to about 1/4 inch thick. Cut out doughnuts with a 2 1/2″ to 3″ round cutter, or form them into cruller twists that you pinch at the ends. Remove to a parchment paper lined baking sheet. Cover loosely with greased plastic wrap and let the doughnuts rise for 30 minutes to an hour, until doubled in size. Meanwhile heat 2 inches of oil in the bottom of a heavy bottomed pot to 350°. Prepare 2 baking sheets; one lined with paper towels, another lined with foil on the bottom & a wire rack on top. In a shallow, wide dish mix together the powdered sugar & milk with a fork. Keep the dish nearby. Carefully place the doughnuts in the oil, 2 or 3 at a time, and fry until golden brown, about 60 seconds per side. Remove from the oil with a slotted spoon and drain on the baking sheet lined w/paper towels. Wait 1 minute or 2 until doughnuts are warm (but no longer piping hot), then dip the tops in the glaze. Gently turn over and dip the bottom in the glaze before removing to the foil lined baking sheet on top of the rack. Allow to sit until glaze has set on doughnuts. Eat immediately or keep refrigerated for up to 2 days. I think that it’s pretty safe to say that all of us love donuts/doughnuts, right? If you don’t then you may as well stop reading because this post (as well as next week’s) aren’t really for you. This is for all of us who love donuts/doughnuts. Why did I give it two spellings? Is there a difference between donuts and doughnuts? I’m not sure if there’s an actual technical difference in the terms, but I do know how *I* personally distinguish the difference. For me, it really just comes down to the method/ingredients. When I think of ‘Donuts’, I think about the method that does not include yeast. 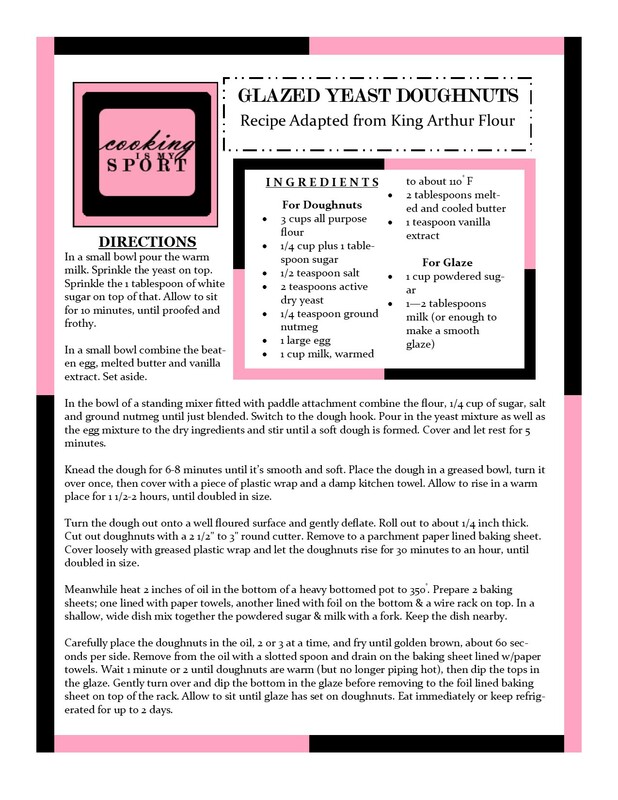 ‘Doughnuts’ do include the yeast in the dough. Don’t ask me why this is. Both donuts and doughnuts create ‘doughs’, but my mind just automatically associates the yeast with the ‘dough’, so there it is. One big difference between donuts made without yeast and doughnuts that are made with yeast is the inner texture. The donuts made without yeast usually use baking powder/baking soda as their leavening and produce a denser, ‘cake-like’ texture. As a result, these are often called cake donuts. Donuts made with yeast have a lighter, airier texture. Cake donuts are a tad bit easier than yeast doughnuts to make since you don’t have to worry about dealing with yeast and rising times. I already described the interior as dense and cakey, while the outside is rough and craggy–this is perfect for catching up whatever topping you choose to put on them, whether it’s icing or sugar. The dough itself for these is flavored with lemon and vanilla. The cinnamon sugar topping I flavored with both cinnamon and cardamom, just to give it an extra spicy note to complement the sweet. In short, these were great. The sugary topping gave a nice crunch to the soft inside and the flavors were spot on. I really wouldn’t change a thing. Sharing at this week’s Fiesta Friday #235Fiesta Friday #235, co-hosted this week by Mara @ Put on Your Cake Pants and Hilda @ Along the Grapevine. In a medium size bowl, combine the buttermilk, melted butter, egg yolks and vanilla extract with a fork. Set aside. In the bowl of a standing mixer fitted with the paddle attachment, combine the flour, sugar, baking powder, baking soda, salt and lemon zest. Add the beaten egg and mix on low for a few seconds. Add the buttermilk mixture and mix until just combined into a stiffish dough. Place a piece of parchment paper on clean work surface and sprinkle it with flour. 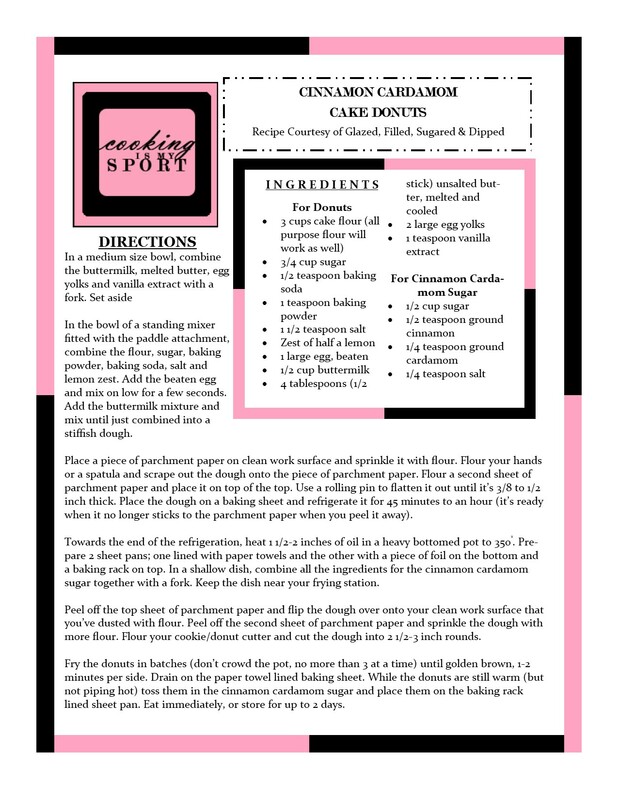 Flour your hands or a spatula and scrape out the dough onto the piece of parchment paper. Flour a second sheet of parchment paper and place it on top of the top. Use a rolling pin to flatten it out until it’s 3/8 to 1/2 inch thick. Place the dough on a baking sheet and refrigerate it for 45 minutes to an hour (it’s ready when it no longer sticks to the parchment paper when you peel it away). Towards the end of the refrigeration, heat 1 1/2-2 inches of oil in a heavy bottomed pot to 350°. Prepare 2 sheet pans; one lined with paper towels and the other with a piece of foil on the bottom and a baking rack on top. In a shallow dish, combine all the ingredients for the cinnamon cardamom sugar together with a fork. Keep the dish near your frying station. Peel off the top sheet of parchment paper and flip the dough over onto your clean work surface that you’ve dusted with flour. Peel off the second sheet of parchment paper and sprinkle the dough with more flour. Flour your cookie/donut cutter and cut the dough into 2 1/2-3 inch rounds. Fry the donuts in batches (don’t crowd the pot, no more than 3 at a time) until golden brown, 1-2 minutes per side. Drain on the paper towel lined baking sheet. While the donuts are still warm (but not piping hot) toss them in the cinnamon cardamom sugar and place them on the baking rack lined sheet pan. Eat immediately, or store for up to 2 days. It’s been quite a week. First, our A/C had a malfunction. Broken air conditioning + tiny apartment + upper floor = stuffy, hot misery. Plus, turning on the oven to cook or bake anything just wasn’t an option. Which, wasn’t fun. Fortunately after 3 days, it was fixed and now things can get back to normal. There’s a story behind today’s recipe. Ready to hear it? I really needed to wash/condition my hair, but I also really wanted to bake. So I decided to do both. I made the dough, then left it for it’s first rise. I went away to wash/condition my hair. I came back, shaped it, then left it for it’s second rise. I rinsed the conditioner out of my hair. I came back and put the bread in the oven to bake. I blow-dried my hair. The bread finished baking. And that’s it. That’s the whole story. I was multi-tasking. Pretty exciting, huh? The ‘how’ may not be too enthralling, but I promise you everything else about this babka certainly is. Babka’s made an appearance before on this blog a few years ago during the 12 Days of Christmas with this Sticky Caramel Pecan Babka Loaf. The word ‘Babka’ itself derives from Bábovka, a yeast based cake from Eastern Europe that manifests in German, Jewish and Polish baking. The dough is usually very enriched, buttery, eggy and spiced. There are countless variations out there and this time I decided to put a little different spin on it from the one I did before. The last babka was flavored with cinnamon brown sugar and pecans. This one’s filling has a bit more: there’s brown sugar, cinnamon, cardamom and ginger inside, along with some orange zest. If you’re fond of them, I did include an option to include golden raisins and walnuts to that mixture (I left them out of this loaf, but please do include them in yours in you’re a fan). As you can see, the filling forms a lovely ribbon on the inside once it’s baked, which brings me to the next step. The method starts out the same as before: the babka dough is rolled out into a large rectangle after the first rise, the filling is sprinkled on top, then the whole thing gets rolled tightly into a thick cylinder. Then, you take a pair of kitchen shears or a very sharp knife and cut down the middle of the cylinder to create two halves. Those two halves get braided together. Now, whereas before I arranged the braid straight into a loaf pan, this time I laid the braid into my tube pan and smushed the two ends together to form a ring. After you let the ring rise and bake it off, you get…this. It’s perfectly fine on its own, but if you’re feeling naughty you can go ahead and add the orange flavored icing on top that literally takes under 5 minutes to throw together and drizzle on top. I’m telling y’all: the extra effort that comes with baking babka is SO WORTH IT. You won’t regret a single step. I never do–not even when I’m multi-tasking with other things to do around the house. And you certainly won’t regret one single bite of this rich, spiced bread that smells and tastes like pure Heaven. Sharing at this week’s Fiesta Friday #234, co-hosted this week by Jenny @ Apply To Face Blog and Deb @ Pantry Portfolio. In a large bowl of a standing mixer, sprinkle yeast over warm water. Sprinkle 1 tablespoon of the white sugar on top of that. Allow to sit for 10 minutes until proofed and frothy. Add the remaining sugar, melted butter, eggs and vanilla extract to the bowl and use the paddle attachment to mix well until combined. Switch to the dough hook and add the flour one cup at a time, beating after each addition, graduating switching to kneading with hands as dough thickens. (You may not need to use all 4 cups, this varies according to location & time of year). Continue to mix until the dough holds together and pulls away from the sides of the bowl; the dough should still be very soft. Sprinkle a work surface with flour. Turn the dough out onto it and use your hands to knead until smooth and elastic and no longer sticky, adding flour as needed. Grease the standing mixer bowl with the vegetable oil, place dough back inside and cover with plastic wrap and a damp clean cloth. Let rise for 1 1/2 hours or until dough has doubled in bulk. Grease and flour a 16 cup tube pan. Combine the brown sugar, cinnamon, ginger, cardamom, orange zest together in a bowl. Sprinkle the work surface with a bit more flour and roll the dough into a large rectangle, about 10 by 18-inches. Brush it down with the melted butter, then sprinkle the sugar mixture on top. (You can use a spatula to help you spread it into a even paste if you like). If you’re using the raisins and nuts, sprinkle those on top of the sugar mixture. Starting from the short end, roll the rectangle up tightly into a log. Pinch the dough ends firmly into the log to seal. Either use a very sharp knife you’ve dipped in water, or a pair of kitchen shears to gently, but swiftly, slice the log down its entire length, creating two halves with lots of layers. Turn the halves so that the layers are facing up. Press the two halves together at the top, then twist the halves around each other, creating a spiral braid. Press the halves together again at the bottom. Gently lift the braid into the tube pan, arranging into a ring with the layers facing up, and tucking one end of the braid under the other. Cover with plastic wrap & a damp cloth and allow to rise for another 50-60 minutes until doubled in size. Preheat oven to 325 degrees Fahrenheit. Bake on the middle rack for 45 minutes to 1 hour until your babka is golden brown (covering with foil if browning too quickly if need be). Cool in the pan for about 20 minutes, then turn out and transfer to a wire rack to cool completely. For Glaze: Mix the sugar and OJ together in a bowl, until the sugar dissolves. Whisk the glaze to smooth out any lumps; drizzle it over the top of the babka and allow to set until hardened. I'm Jess(ica). Cooking is my sport. The kitchen is my field and arena. I practice all the time and this blog's the proof. Lemme find it for you! All of the pictures that appear on CIMS are taken by me. I'll appreciate it if you post them elsewhere and give credit where credit is due (to me and the blog). However, If you just take them and try to take credit for them yourself, or just don't even link back to my blog to say where you found them...that I don't really appreciate. At all. Do me a favor and just don't do it, okay? Never Miss a Post: Subscribe by Email to CIMS Now! Are you not on Wordpress? Do you like good food? Click here to subscribe to my blog by email. Never Miss a Post: Subscribe to CIMS Now!